“SCF works to broaden and diversify expert discussion by focusing on hidden aspects of international politics and unconventional thinking. Benefiting from the expanding power of the Internet, we work to spread reliable information, critical thought and progressive ideas.” Yes, all the good stuff. Only one detail is forgotten: nowhere on the page you can learn that the site is registered and managed in Russia. This is only disclosed by site data. Why hide it? Why are the managers of the site trying to hide the fact that the site is Russian? Well, one reason might be that it gives Russian pro-Kremlin media a possibility to quote “International Media”. 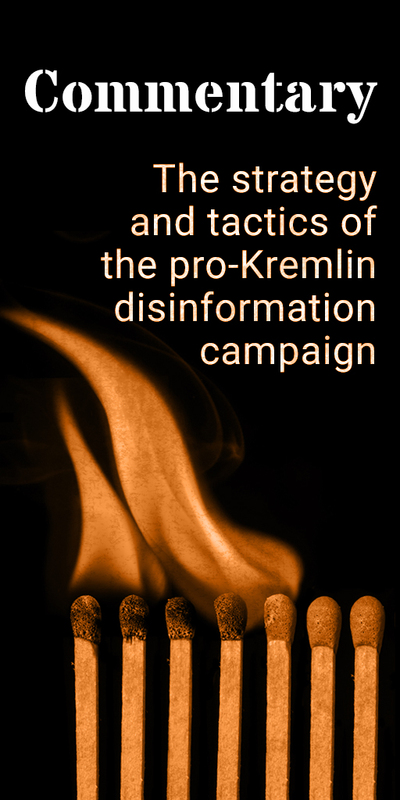 We can note references to the site occasionally on pro-Kremlin media outlets, like here or here. Russian sites, translating Russian articles. If there actually exists a foundation, called the Strategic Culture Foundation is impossible to say. The site gives no information on owners, editors, visiting address. There isn’t even an e-mail address for contacting the site: only a form for requests. 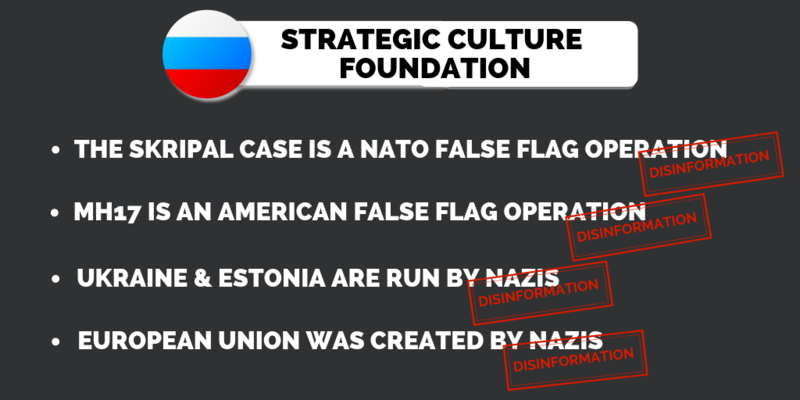 The authors of the site are loyally relaying Russian narratives on issues of Russian interest: The Skripal Case is a Nato False Flag Operation. The MH17 is an American False Flag Operation. Everything is an American False Flag Operation. Ukraine is Run by Nazis. 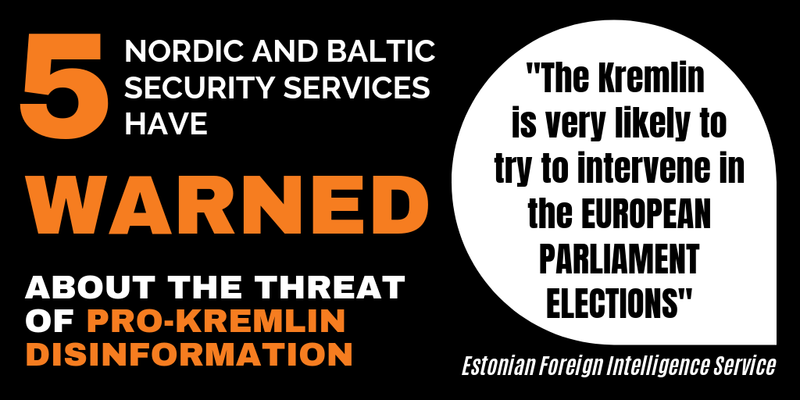 Estonia is Run by Nazis. The European Union was created by Nazis. Luckily, Russians have Excellent Weapons. US President Trump is good when he supports Russia and bad when he acts against Russian interests. The site generously gives room for elaborate conspiracy theories on the Deep State, Soros or the Jews. The mission statement’s “progressive ideas” seem to include homophobia, xenophobia and antisemitism. In the world of Strategic Culture Foundation citizens are merely pawns, used by the powerful elites. The idea of citizens taking to the streets voluntarily to express protests against economic grievances, corruption and hardship is unfathomable for the authors. Mass protests are always staged, by the US, by Soros, or, obviously, by the Deep State. The “progressive idea” of Strategic Culture Foundation is that authoritarianism is good. Powerful, potent, populist potentates – Kim Jong-Un, Putin, Maduro, Xi, can always rely on the support of the authors. As long as it suits Kremlin, that is.